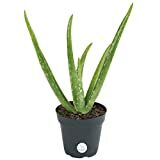 Aloe harlana growing leaf plant succulent of the genus Aloe also known as Aloe harlanii, Aloe harlana perennial evergreen used as ornamental drought tolerant plant, can grow in mediterranean, desert, subtropics climate and growing in hardiness zone 10+. 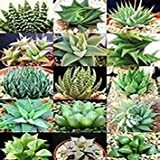 Leaves color green with white or yellow stripes little spiny in the edge in cone triangle shape, the leaf thin in size of 5-10 cm, leaves grow in rosette shape. Flower color orange-red in cone shape the flower grow on stems that grow in the middle of the plant. 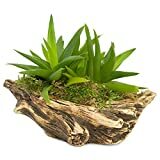 Natural Elements Log Planter (Boat) – Realistic Woodland-Themed with Intricate Weathered bark Detail + Fiber Soil + Moss Mulch. 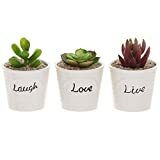 Grow Small Succulents, Cactus, African Violets. Striking in Any décor.